Are you craving more spice in your life, or at least on your plate? Developing a passion for peppercorns is a great way to satisfy your demanding palate and to awaken your senses to the depth and complexity of the Southeast Asian spice that helped to shape human history and the world map. But if you’ve never experienced more than a few flakes of stale ground pepper shaken from a tin can purchased from the grocery store, you’re in for a flavorful if not colorful surprise. From white to black and green to pink, pepper can do a lot more than just sit on top of a mound of mashed potatoes. Pepper comes from the drupes, or berry-like fruits, of a climbing vine botanically known as Piper Nigrum and commonly called — what else? — pepper vine. Depending on the region	and the type of finished product desired, the hand-picked fruits are subjected to varying degrees of moist heat to promote fermentation and are then dried by forced air via machines or by basking for several days in the sun. Once dried, a peppercorn is born. From here, a peppercorn may be destined to become a component of bottled pickling brine or to be packaged and sold whole "as-is" or as pre-cracked or ground pepper. For most people, the purchase of ground black pepper from the supermarket isn’t much of a financial setback. At one time, however, the price of pepper was nothing to sneeze at. In fact, peppercorns have been used as currency or collateral at different times in history. To this day, peppercorn payments legally refer to a nominal monetary consideration in the creation of an agreement to make a purchase of, for example, real estate or a car. These minimal payments are commonly expressed in deeds and title transfers as, “in consideration of one dollar,” to reflect the transfer of ownership without divulging the actual purchase price. 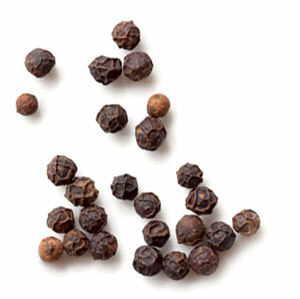 Black peppercorns are the most widely traded spice in the world and are the most popular in the United States. These little black gems get their wrinkly appearance from a hot water soak before they are dried. Because these peppercorns are picked at the halfway stage to maturity, they possess more pungency than other peppercorns. 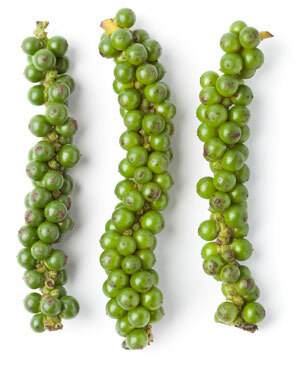 Green peppercorns, as the term implies, are harvested while still very green, making them much milder in flavor. In contrast, white peppercorns are allowed to fully ripen on the vine and are exposed to a long soaking, heat and chafing to remove the outer skins. This produces a cream-colored peppercorn with a pungent yet earthy flavor profile. The answer would be the pink peppercorns which, although they do indeed look, taste and smell like the others, are not true peppercorns but are the dried fruits of the Brazilian pepper tree. Similarly, rust-colored Szechuan peppercorns are obtained from the seeds of an Asian species of rue that imparts a spicy, lemony flavor to foods but lacks the pungency and heat of true peppercorns. Use to add zing to dips, sauces and other foods when you want to avoid visible specks of black pepper. White pepper is also used in cookies, breads and other baked goods. Use to make peppercorn sauce, pickling brines and in French and Creole recipes. Green pepper is also used to add mild flavor to Chinese and Thai soups and sauces. Lends a sweet and slightly fruity flavor to foods. Pairs well and makes a memorable finish to frozen treats and fruit salads. impostor alert: Though peppery in taste this is not a Piper Nigrum-peppercorn! Enhances the flavor of most foods. For best results, crack or crush fresh peppercorns when needed by hand with a mortar and pestle or with a pepper mill. Enjoy as a general seasoning and finishing pepper at the table with the perk of providing a blend of peppery flavors and a rainbow of colors. Best flavor is achieved by lightly toasting before crushing. Excellent with fish, poultry and beef, especially in Szechuan recipes.